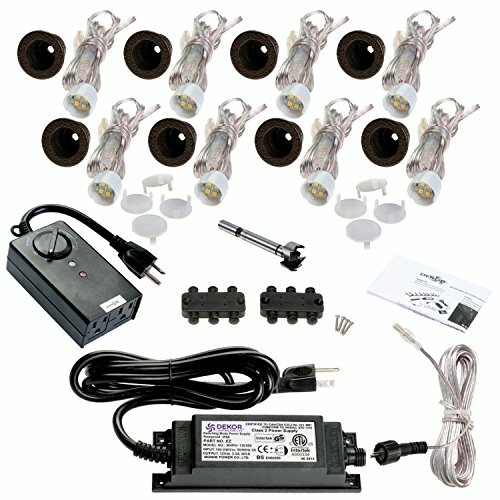 Outdoor LED Recessed Down Light Kit - 8 LED Lights Outdoor recessed LED down lights from the DEKORTM Millennium Collection are used under porch overhangs and under decks to add light, safety and ambiance. Use under handrail for a unique look. These low voltage lights are easy to install, virtually flush with the surface, and hardly visible. The kit comes complete with almost everything you need, just add wire. Down lights cast light straight down from lamp For down lighting, up lighting. Down lights cast light straight down from lamp. LED Green Technology. Using our LED down lights will save energy and money over the lifetime of the product; LEDs require up to 80% less energy than traditional light sources. Dimmable warm white light. The lights share the same light spectrum as other DEKOR lighting (3200° K), the ambiance of incandescent lighting. The lights are also dimmable with DEKOR's EZDIMMERWP. Long lasting and durable. The lights are waterproof, weatherproof, and salt air resistant. The housing is made of alodine coated aircraft grade aluminum. The housing has a powder coated finish with built in UV protection, making it long lasting and durable. All our recessed lights are backed by an industry leading 10 year / 30 year warranty. Expandable. Our outdoor down light kit comes with 8 LED lights. The kit is expandable meaning you can add more lights up to the number supported by the transformer or power supply. If you need more lights, you can just upgrade the transformer. Use this outdoor recessed LED down light kit to add safety and accent lighting under porch overhangs and under decks. Perfect for decks, docks, patios, and embedding in concrete walkways, turn them upside down for soffit or under-deck lighting or anywhere you need accent lighting. Down lights cast light straight down from lamp. Easy installation. Featuring our Plug and Play connectors. No need for stripping wires. If you have any questions about this product by DEKOR, contact us by completing and submitting the form below. If you are looking for a specif part number, please include it with your message.